My boss loves The Book Thief it's her favorite YA book of the last 20 years. I asked her why she loves it and she gave me many reasons including the clever narrative structure and the memorable graphic novel elements. Mostly though, she likes the narrator, because she likes Death’s sense of humor. I started out listening to The Book Thief as an audio book, so it took me a while to figure out that the structure was like a shelf of stolen books, each with a contents page of chapter headings. Then my boss told me about the graphic elements and I realized I was definitely missing something. I ran out to the library and borrowed a copy. 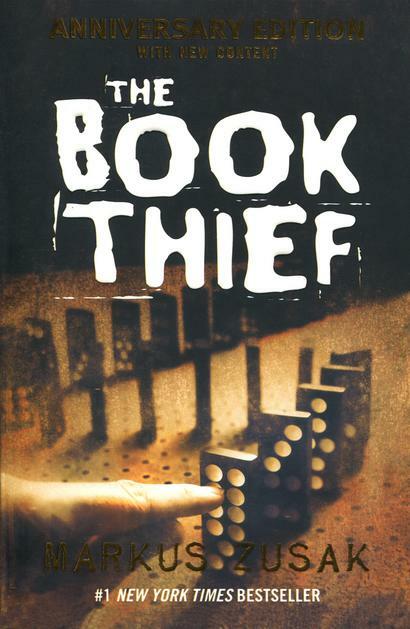 Having a real copy of The Book Thief in your hand is essential to reading and understanding it. What’s it about? The Book Thief is a young girl named Liesel Meminger, she is nine years old when we first meet her and 17 years old at the end of the story. She’s growing up in a small town in Nazi Germany with her foster parents and a childhood trauma that gives her nightmares every night. As the Nazi Party grows in power so does her desire to read, which leads her to steal books from a graveyard, a bonfire and a library. The family shelter a Jewish man named Max who writes books for Liesel on pages torn from Mein Kampf and painted over with white house paint. When the Allied bombs start to fall, Max must escape, Papa must go to war and Death, who narrates this book, must be busy. Is it any good? Yes. Definitely. It’s one of those books with haunting images that you carry around with you for a long time after you finish reading. The “parades” of “Jews and other miscreants” shuffling tiredly down the road toward Dachau. Rudy Steiner standing waist deep in freezing water to retrieve a book and standing there longer to ask Liesel for a kiss. The Standover Man, the book written by Max while he hides in the basement, with the text of Hitler’s book showing through in places beneath the paint. And he never lets his readers hope for a happy ending to this story. “I know what happens and so do you”. Despite his best intentions Death ends up paying considerable attention to the stories of the humans whose souls he will inevitably gather. He’s an empathetic character, although he’s tortured by that empathy. “I am haunted by humans.” Is his final sentence in the book. And honestly, I am haunted by them too. Why is it on the list? I recently talked to a colleague of mine who is a Senior in High School, she told me that in Junior year her whole class have a reading list the students call “Death and Destruction” and The Book Thief is on that list. It’s high on the list of popular books for Book Clubs on Goodreads and to date has sold 16 million copies worldwide. It’s a crossover book, read by adults and teens alike. The Book Thief is big news everywhere. What interests me is the The Book Thief’s window into reasons for emigration to the US from war torn Europe. I expected there to be an influx of Jewish refugees to America, although I was surprised to learn that the American government initially turned away boatloads of people until the Displaced People’s Act of 1948. The Book Thief introduces us to a German population, starved, terrified and oppressed. No wonder they left Germany. From 1941 to 1950, 1,035,000 people immigrated to the U.S., including 226,000 from Germany, 139,000 from the UK, 171,000 from Canada, 60,000 from Mexico and 57,000 from Italy. Perhaps this is one of the reasons for the continued worldwide popularity of this book. Many families left the old world after World War II, so to read about their ancestors reasons for leaving must be powerful indeed. The Book Thief inspires empathy and compassion in its readers, so the popularity of the book is heartening. After all, if Death can manage all the feels, then so can American readers.